I pledge to stop using the disposable produce bags at the grocery store! The U.S. alone uses over 100 billion plastic bags and produces 31 million tons of plastic waste per year. Plastic bags are a huge problem to dispose of because each one takes up to a thousand years to degrade. Where are these billions of bags going in the meantime? Each square mile of the ocean contains 46,000 pieces of floating plastic, much of it drifting to the ocean floor where it will never degrade, or entangling sea animals who mistake it for food and often die trying to eat or escape from the debris. Many people have adopted reusable grocery bags, but you can take the extra step of pledging to stop using smaller plastic bags for your produce and bulk goods. - Buy small reusable bags (http://www.bagitmovie.com/shop.html or http://www.chicobag.com/ or http://www.reuseit.com/ have good options). - Get crafty and try making your own bags out of old t-shirts, old cloth napkins or netting. - Or, let your broccoli and kale and lemons and apples all hang out together in your reusable bag and in the crisper drawer. Your veggies and fruit won’t mind -- you’ll wash them before eating anyway. By doing so, you’ll take a small action that has the big cumulative effect of reducing waste and protecting the environment. Labels: Plastic Facts, Re-usable Bags, What Can You Do? The recent proposal by Council Member Kirstin Hytopoulos that Bainbridge Island consider the banning of plastic grocery bags has evoked discussion and protest, much of it centered on the convenience of these bags, not only for items purchased at the store but for numerous uses around the home. No one can argue that plastic bags are convenient and can be used for many purposes. But they are not a necessity. In the 1950s, the era that many look back to as a golden age, plastic bags were unknown. Yet people went about their lives feeling no particular inconvenience. As late as the 1980s, European cities, including Vienna, provided no plastic bags for grocery or other customers. Even in the most exclusive areas of the city, a customer was expected to bring his own bags to transport any purchases. People live very comfortably without the convenience of plastic bags. Marine life, however, does not fare so well. Fifty plastic bags were found in the stomach of a dead whale that recently washed up on a Washington beach. An area the size of Texas, consisting of plastic waste from throw-away cultures, now exists in the middle of the Pacific Ocean, growing every day as runaway consumption continues across the globe. Plastic is ruining our environment, despoiling our scenery with roadway litter, choking our sea mammals with plastic bags, filling our landfills to overflowing, and poisoning our oceans and creatures that depend on the oceans for sustenance. As plastics slowly degrade, their chemical components are released into the seas and into the sea life that consume the plastic particles, mistaking them for food. Finally these poisons return to us when we eat fish. Does anyone think this way of life can continue? It will have to cease at some point. No matter how many well-meaning people recycle, the majority don’t. Why continue down a road that leads to even more despoliation? I would like to see Bainbridge Island join other communities that have faced the implications of this way of doing business and have said no to plastic bags. Labels: Bag Bans, Letter to the Editor example, What Can You Do? If you have just 7 minutes, please watch this sobering video from Marine Researcher, Charles Moore. A third generation resident of Long Beach, California, Captain Charles Moore grew up in and on the Pacific Ocean. His father was an industrial chemist and avid sailor who took young Charles and his siblings sailing to remote destinations from Guadalupe Island to Hawaii. Charles attended the University of California at San Diego where he studied chemistry and Spanish. After 25 years running a woodworking and finishing business, Charles founded Algalita Marine Research Foundation in 1994. In 1995 he launched his purpose-designed, aluminum-hulled research vessel, Alguita, in Hobart, Tasmania, and helped organize the Australian Government's first "Coastcare" research voyage to document anthropogenic (human-caused) contamination of Australia's east coast. Upon his return to California, he became a coordinator of the State Water Resources Control Board's Volunteer Water Monitoring Steering Committee and developed chemical and bacterial monitoring methods for the Surfrider Foundation's "Blue Water Task Force." As a member of the Southern California Coastal Water Research Project's Bight '98 steering committee, he realized the need for and provided a research vessel so that Mexican researchers from Baja California could participate for the first time in assessing the entire Southern California Bight along the coastline from Point Conception to San Diego. Oceanographic Research Vessel Alguita and its Captain found their true calling after a 1997 yacht race to Hawaii. On his return voyage, Captain Moore veered from the usual sea route and saw an ocean he had never known. "Every time I came on deck to survey the horizon, I saw a soap bottle, bottle cap or a shard of plastic waste bobbing by. Here I was in the middle of the ocean and there was nowhere I could go to avoid the plastic." Ever since, Captain Moore has dedicated his time and resources to understanding and remediating the ocean's plastic load. Along with collaborators from the Southern California Coastal Water Research Project he developed protocols for monitoring marine and beach micro-plastics which are now used worldwide. "A Comparison of Plastic and Plankton in the North Pacific Central Gyre". Article by C.J. Moore, S.L. Moore, M.K. Leecaster, and S.B. Weisberg, Algalita Marine Research Foundation and Southern California Coastal Water Research Project. Published in Marine Pollution Bulletin 42 (2001) 1297–1300. "A Comparison of Neustonic Plastic and Zooplankton Abundance in Southern California’s Coastal Waters". Article by C.J. Moore, S.L. Moore, S.B. Weisberg, G.L. Lattin, and A.F. Zellers; Algalita Marine Research Foundation and Southern California Coastal Water Research Project. Published in Marine Pollution Bulletin 44 (2002) 1035–1038. The first paper documented his 1999 study, which shocked the scientific world when it found 6 times more plastic fragments by weight in the central Pacific than the associated zooplankton. His second paper found that plastic outweighs plankton by a factor of 2.5 in the near coastal surface waters of Southern California. To date, Captain Moore has conducted ocean and coastal sampling for plastic fragments through more than 40,000 miles of the North Pacific Ocean, across 22 degrees of latitude and 70 degrees of longitude. His latest 10,000 mile voyage took him and his crew two-thirds of the way to Japan across the International Dateline. Captain Moore's work has been highlighted in numerous major media outlets, including ABC’s Nightline, Good Morning America, National Public Radio, Rolling Stone, and The Wall Street Journal. Yesterday, we took a look at invisible winds suddenly made visible, streaming across the Earth. This being the blustery season, I've got more wind today, this time streaming across the sea, but looking uncannily like a van Gogh sky. I like watching the Gulf Stream roar past the tip of Florida in the beginning, all white and purposeful, heading up the North American coast. There's something playful about water and wind bumping into large land masses likeAfrica, breaking into whirligig spirals, spinning along the shore. Then there's the equator, which in this version seems almost wall-like. As the winds approach it, they flatten into jet like streams racing along a corridor. What this map doesn't show is the newest discovery created by ocean gyres. It's called the Great Pacific Garbage Patch, a vast, Texas-sized clump of human garbage floating in the Pacific. Created by a convergence of ocean currents and wind somewhere between Hawaii and California, it's not visible from satellites. Apparently, a thick blanket of pop bottles and chemical sludge sinks a little below the surface so it can't be seen from above and, anyway, it turns out garbage doesn't clump in a spiral; it looks more like a Nickelodeon splat, so if we could see the Garbage Patch, it would ruin the mood created here. This is an image of wild wind, water and spiral beauty. And what does it say about us that our first human mark is a splat that feels like we've dropped some mud onto a van Gogh painting? Click on this video, and you'll see the dance of wind-on-water everywhere. Thanks to reader Donald Thomas for mentioning this video yesterday; and also to Jason Kottke, the blogger who gets everything earlier than everybody. Also, Google Earth has an interactive ocean current explorer illustrated here. New data released by the Ocean Conservancy highlights the need for humans to clean up their acts. The numbers, generated during the 2011 International Coastal Cleanup last September, are staggering. With 598,076 volunteers around the world who picked up 9,184,428 pounds of trash from 20,776 miles of shorelines, rivers and lakes, it’s not surprising what is the most prolific item found – cigarette butts. If you are wondering how Ocean Conservancy knows down to the last one, how many butts there were, each volunteer is issued an inventory control sheet to keep tabs. By now you are probably feeling a little ill, seeing just how much junk is floating around and landing on the world’s shores. But what about the damage being done to our wildlife? We know better — they don’t. Over the past 26 years, more than nine million (9,361,453) volunteers have removed one hundred and fifty-three million (153,790,918) pounds of trash from more than three hundred and twelve thousand (312,290) miles of coastline and waterways in 153 countries and locations. Enough clothing (266,997 items) to outfit every expected audience member of the London 2012 Summer Olympics Opening Ceremony. Enough food packaging (940,277 pieces) to get takeout for breakfast, lunch and dinner every day for the next 858 years. Enough light bulbs (24,384 bulbs) to replace every light on the Eiffel Tower. Enough beverage cans and glass beverage containers that, if recycled, would net $45,489.15. Enough balloons (93,913) to provide one to every person expected to attend the 2012 NCAA Men’s Basketball National Championship. Enough cups, plates, forks, knives and spoons (707,171) to host a barbeque for every student enrolled at Ohio State University, University of Louisville, University of Kentucky, and University of Kansas, to celebrate their teams’ appearance in the 2012 NCAA Men’s Basketball Final Four. Fifty-five million cigarettes butts, which if stacked vertically, would be as tall as 3,613 Empire State Buildings. Enough glass and plastic bottles to provide every resident of New York City, Los Angeles, Chicago, Houston, and Philadelphia a cold beverage on a hot summer day. Enough appliances (125,156) to fill 37,434 single-axle dump trucks. More than 870 thousand (870,935) diapers – enough to put one on every child born in the UK last year. Enough cups, plates, forks, knives and spoons to host a picnic for 2.15 million people. You can make a difference by choosing to avoid single-use plastic items like water bottles and picnic utensils that end up as ocean trash. If you have to smoke, don’t toss the butts, dispose of them properly in a bin, or better yet, quit! The Coca-Cola Company has supported Ocean Conservancy’s International Coastal Cleanup for the past 17 years. Other national sponsors include National Oceanic and Atmospheric Administration, Altria Group, Inc., The Dow Chemical Company, Landshark Lager, Glad, The Walt Disney Company, Brunswick Public Foundation, Teva and U.S. Environmental Protection Agency. Ocean Conservancy is the world’s foremost advocate for the oceans. Through science-based advocacy, research, and public education, it informs, inspires and empowers people to speak and act for the oceans. Labels: Impacts on Marine Life, International Coastal Cleanup, Ocean Conservancy, Plastic Facts, Plastic Soup in our Oceans, Top Five Littered Items, What Can You Do? Floating on or just beneath the surface of the north Pacific Ocean, over 1,000 miles (1,610 km) from any landmass, lies a soup of trash; the Great Pacific Garbage Patch (GPGP). Located in the North Pacific Sub-tropical Gyre that covers approximately 10 million square miles (25,890,000 sq km), it covers an area two and a half times the size of France, the largest country in Western Europe, and is 20 percent larger than South Africa. Discovered in 1997 by Charles Moore, ironically an heir to a petroleum fortune, the GPGP is a mass of plastics, debris, and lost or discarded fishing nets. Nearly 90 percent of all floating marine litter is plastic, a petroleum-based substance that takes decades to be broken down on land by the suns’ rays, and even longer in the cool seas where it is often further protected by barnacles and algae. Plastic pellets used in all sorts of packaging and plastic products are the most commonly found marine pollutant. Also known as nurdles or mermaids’ tears, 50 million tonnes are produced every year. 80 percent of marine rubbish comes from land via winds and rivers, with ocean currents carrying debris from the west coast of North America to the gyre in about five years, and debris from the east coast of Asia in a year or less. The remaining rubbish comes from ships with a typical 3,000-passenger cruise ship producing over eight tons of solid waste weekly, much of which ends up in the patch, alongside floats and other equipment illegally jettisoned from commercial and fishing vessels to avoid the cost of proper disposal in port. Then there are the contents of the estimated ten thousand cargo containers that fall overboard every year. One container can hold 10,000 running shoes, 17,000 ice hockey gloves, or a million pieces of Lego. Given the number of consignments lost and the longevity of the products, there are hundreds of thousands, if not millions, of sports shoes floating in the seas. In fact, the Garbage Patch name was coined five years before Moore’s discovery, by Seattle oceanographer Curtis Ebbesmeyer whilst studying a consignment of 29,000 plastic bathtub ducks lost from a container ship during a Pacific storm. Using oceanic current modelling software and plotting the positions where ducks were found, he became aware of a slow vortex into which debris was drawn. Unfortunately, most of the trash is not brightly coloured ducks and running shoes, but mostly small plastic particles suspended at or just below the surface, making its detection by aircraft or satellite impossible. The U.N. Environment Program estimates that 46,000 pieces of plastic litter are floating on every square mile of the oceans, whilst the GPGP when last surveyed, contained at least six times more plastic matter than plankton biomass, the bottom of the food chain. As the founder of the non-profit Algalita Marine Research Foundation, he began looking into the sources of the problem and its extent. In 1999 he returned to undertake the first scientific sampling of the area he describes as two to three times the size of Texas, but that he fears could be greater than the surface area of the United States. In June 2009, with Moore on board for his tenth mission to the area, the ORV Algalita set off on the a four-month mission to gather more data to try to gain further understanding into the wide-ranging and poorly understood potential impacts of oceanic micro-plastic pollution. The first leg of the trip concentrated on sampling the area around Hawaii, providing both water samples from trawls and fish tissue samples for analysis back on land. It is believed that a significant amount of the plastic pollution currently cycling around the North Pacific passes around or through the Hawaiian islands, making the area a suspect for high concentration of small particle pollution as well as large ghost net pollution. The importance of these islands, with their pristine reef ecosystems, for a myriad of species means that a full understanding of how these animals and their environment are interacting with plastic pollution is needed. Whilst analysis of the samples is still ongoing (it is a slow process and an area for which funding is hard to find), the expeditions have discovered the widespread ingestion of plastic particles by fish that forage on plankton at night on the ocean surface. In trawls, a total of 660 fish, representing six species, were captured for future study. Of these fish, 35 percent had ingested micro-plastic particles, the record holder having 83 fragments. Plastics absorb Persistent Organic Pollutants (POPs) from paint chips, coolants, pesticides, and metals, so when fish eat plastic matter and then bigger fish eat them, the chemicals could be bioaccumulating. Do the micro plastic particles contain POPs, and do these harmful pollutants migrate into the tissues and organs of the fish that ingest them and subsequently enter into the human food chain? Concentrations of the most frequent POPs (PCBs, DDT, and PAH – all renowned for their effects on the human organism) on nurdles collected from Japanese coastal waters, were found to be up to one million times higher than the levels detected in surrounding seawater. The new data from the NPSG could have far-reaching effects. Although the actual analysis of the samples will take up until into 2012, visual observation comparing photos of the worst trawl in 1999 to the lightest in 2009 showed that the accumulation has not only a higher concentration of micro plastics but, according to Captain Moore, there was a record number of macro plastics. Things like parts of buoys, crates, bottles, caps, plastic popsicle sticks, umbrella handles, numerous oyster spacers, and builders’ hard hats were often found or observed floating on the surface. On the last leg, the six crew members collected samples using a manta trawl with a rectangular opening of 0.9×0.15 m2, and a 3.5 m long, 333u net with a 30×10 cm2 collecting bag at a speed of 2.5 knots for an hour at a time, taking 52 samples. Sampling concentrated on the surface, where most of the items were found just below the surface tension, with only a small part, such as 55-gallon drums, breaking the surface. There were items full of air like buoys and capped bottles that floated on the surface but, above all, location in the water column depends on sea state. If the ocean is rough, the trash is forced down deeper. When it is calm, it rises toward the surface again, although Captain Moore, the only crewmember remaining from the 1999 sampling expedition, has found plastics over 100 metres deep, using a bongo trawl. Every sample came back with large quantities of plastic particulates. Though it’s difficult to quantify just how much more without the data from the samples, according to Captain Moore, it appears to be significantly more. He estimated that the weight of the plastic debris there has doubled in a decade and is accumulating at an ever-increasing speed. She became nauseated. “After witnessing the first few samples I thought, “Yep, that’s why I’m out here. But after the 20th trawl, I began hoping the sample would come back free of plastic.” She said, “Shouldn’t there be just one that doesn’t have plastic in it? But to no avail. I have to wonder if there is anywhere on this planet we haven’t polluted”. One major difference from 1999 to 2009, was that the amount of large items that were navigational hazards. Ghost nets that barely break the surface so it is difficult to see them until you are upon them. They can weigh up to 500 kilograms or more. “We managed to remove one that was around 200 lbs. If we had run into it, it could have done serious damage,” said Monteleone. The crew also had a near miss with a telephone pole which came within a few feet of the starboard pontoon. There was also a large item strapped to a wooden pallet that was about three feet square that they dared not approach too closely. The props were fouled several times with derelict fishing gear and went so far as to stop the engines in the middle of the night. Crewmember Jeff Ernst had to free dive under the boat to disentangle them. Even though there are no common shipping lanes nor cruise lines and very little if any fishing occurring near or in the GPGP, there is evidence of our negative plastic influence everywhere. If this picture wasn’t shocking enough, recent expeditions run by The 5 Gyres Project, a collaboration among AMRF, Livable Legacy and Pangaea Explorations, to the planet’s four other major gyres in the North Atlantic, Indian Ocean, South Atlantic and South Pacific, have all come back with sampling nets containing considerable quantities of plastic. Further sampling is being carried out to gain an even more accurate picture, through The 5 Gyres Project “Travel Trawl” program, where research equipment is loaned to other sailors and “citizen scientists” to collect ocean samples. Ingestion of plastic items kills an estimated 100,000 marine animals yearly, as plastic mistaken for food fills the stomach and impedes digestion of proper nourishment. According to Pulitzer Prize-winner Kenneth Weiss’s research, young albatross are killed in their hundreds of thousands, and corpses on Midway Island have been found with all sorts of plastic matter in their stomachs, including ballpoint pen lids, toy soldiers, dinosaurs, perfume bottles, highlighter pens, and disposable lighters. Albatross are by no means the only victims. An estimated one million seabirds choke, or become tangled in plastic nets or other debris every year. About 100,000 seals, sea lions, whales, dolphins, other marine mammals and sea turtles suffer the same fate. Furthermore, buoyant micro plastic particles ingested by small deep-sea fish may negatively affect their ability to return below and to exist in their normal habitat. Scientists already estimate that nearly half of all seabird species, all sea turtle species, and 22 species of marine mammals are harmed or killed by plastic waste through ingestion, entanglement or strangulation, before the debris has been broken down into tiny fragments. What can be done about it? For the matter that is already in the gyres, very little. Collecting it and disposing of it would be a monumental exercise that no government would be willing to fund, unless it were to start having tangible negative effects on human health. It would appear that the only answer is to stop more plastic from getting into our oceans. Ultimately, consumption and production have to be curtailed by educating consumers and placing the responsibility on the manufacturers that produce the myriad of plastic goods and plastic packaging that are such an intrinsic part of everyday lives. But in a society increasingly reliant on plastic substances, that may be a task as big as the Garbage Patches themselves. Plastic can seem pervasive at times. 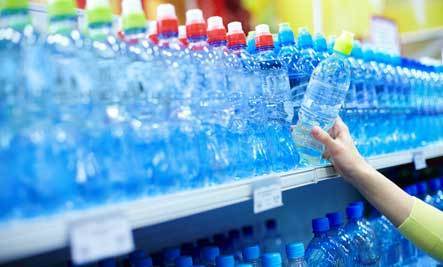 From food packaging and storage to flooring and household goods, plastic is everywhere. There are a number of ways that we try to eliminate plastic from our lives—taking reusable shopping bags to market, avoiding processed pre-packaged foods, eschewing the use of water bottles—but without drastic measures it can be nearly impossible to rid this non-biodegradable substance from our lives for good. Not all plastic is created equally, so if you’re picking and choosing plastics to rid from your life, start with these. To avoid #3 plastics, don’t buy PVC shower curtains; opt for natural fabrics like organic cotton, linen or hemp. Don’t give young children plastic teething rings, and don’t wrap food in plastic wrap. #6 PS (polystyrene): You’re probably most familiar with this plastic from Styrofoam. Polystyrene is made of petroleum byproducts and can be found in foam food containers, meat trays, plastic cutlery and more. Recycling polystyrene can be difficult, and because it’s so light, polystyrene is easily picked up by the wind and tossed into the ocean where it contributes to marine pollution. Polystyrene has been known to leach styrene, a possible neurotoxin and carcinogen that has been linked to hormone disruption, infertility and cancer. To avoid #6 plastics, don’t store food in foam containers, especially fatty foods such as meat and cheese, which are more likely to absorb chemicals; try taking your own glass to-go containers when you eat out. To learn more about the health risks of these and other plastics—and for more ways to eliminate plastic from your life—check out the article “De-Plasticize Your Life” from Natural Home & Garden. Labels: BPA, Endocrine Disruptors, Harmful Plastics, Health and Safety, Oestrogenic Chemicals, Phthalates, Plastic Facts, What Can You Do?